Anise Almond: Enriched wheat flour (flour, malted barley flour, niacin, reduced iron, thiamine mononitrate, riboflavin, folic acid), sugar, eggs preserved with nisin preparation, roasted almonds, olive oil, anise seed, baking powder (sodium acid pyrophosphate, baking soda, corn starch, monocalcium phosphate monohydrate, calcium sulfate), anise oil, natural flavor. 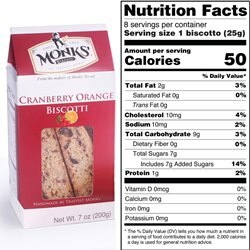 Cranberry Orange: Enriched wheat flour (flour, malted barley flour, niacin, reduced iron, thiamine mononitrate, riboflavin, folic acid), sugar, sweetened dried cranberries (cranberries, sugar, sunflower oil), eggs preserved with nisin preparation, oats, olive oil, crystallized orange powder (citric acid, orange oil, orange juice, ascorbic acid, organic dried cane syrup), crystallized lemon powder (citric acid, lemon oil, lemon juice, ascorbic acid, maltodextrin), natural flavor, salt, baking powder (sodium acid pyrophosphate, baking soda, corn starch, monocalcium phosphate monohydrate, calcium sulfate). Dark Chocolate: Enriched wheat flour (flour, malted barley flour, niacin, reduced iron, thiamine mononitrate, riboflavin, folic acid), eggs preserved with nisin preparation, sugar, semi-sweet chocolate chips (unsweetened chocolate, cocoa butter, soy lecithin, natural flavor), olive oil, cocoa processed with alkali, baking powder (sodium acid pyrophosphate, baking soda, corn starch, monocalcium phosphate monohydrate, calcium sulfate). Apr 20, 2019 | By Bob J. Both the Chocolate and plain biscottis were excellent. Feb 1, 2019 | By Sheryl W.
I ordered quite a bit and gave it out as gifts! No complaints from recipients! I loved the biscotti especially the Anise Almond. It reminded me of the delicious biscotti I used to have growing up when I lived near Little Italy. The butterscotch coffee is also delicious. Other items were given as gifts, so I am not sure how the lucky receivers liked them, but I am sure they were appreciated. In general, I am able to find a gift for all hard to buy for people because your merchandise is so novel, and well made. 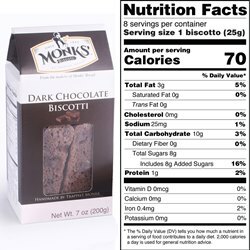 Feb 2, 2018 | By Margaret M.
My favorite is the Dark Chocolate Biscotti - really great dark chocolate. These were very tasty! I liked dipping them in my tea or coffee. These are great -will definitely be re-ordering. Jan 13, 2017 | By MICHAEL S.
WHEN I SAW THESE BISCOTI IN THE CATALOG, I THOUGHT I'D TAKE THE CHANCE AND SEE WHAT THESE WOULD BE LIKE. WHEN THEY ARRIVED THEY WERE IN PERFECT CONDITION, NOTHING BROKEN. THE TEXTURE OF THIS PRODUCT CAN'T COMPARE WITH THOSE THAT ARE ON THE MARKET TODAY. THESE ARE SUPERION!!!! I WILL BE ORDERING MORE IN THE NEAR FUTURE AND I HIGHLY RECOMMEND THIS PRODUCT. 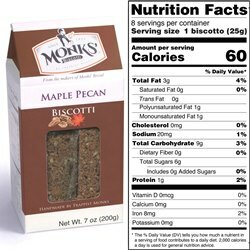 Jan 10, 2017 | By Coleen H.
The Monks have out done themselves again with the wonderful addition of biscotti. Each flavor is fresh, delightful and stands up to my coffee wonderfully! Just the right balance of crunch and flavor! Each flavor is better than the other, but the chocolate is flavorful without being too sweet and blends well with coffee and/or red wine! Jan 3, 2017 | By Stephen N.
I could eat these all in one sitting. I did not. I spread the pleasure out over a few days. I then bought this as a gift. I will place another order for me. 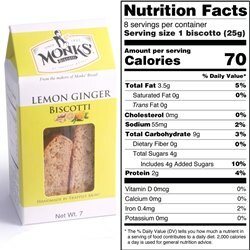 The combination flavor of lemon ginger is so outstanding together. Another biscotti you can't eat just one. This biscotti is so good. The flavor is just perfect amount. So good, can't just have one. This biscotti has the right amount of flavor, Anise Almond. You just can't eat one, they are addictive. Worth buying. Better than what you find in the grocery store. These are very flavorful, especially dunked in tea! and there is plenty of anise flavor in these biscotti! It was hard not to eat the whole package at one sitting. Great with coffee! Jan 3, 2016 | By Martha C.
Cranberry Orange is one of my favorite flavor combos and these biscotti capture it perfectly! 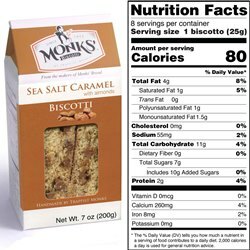 These biscotti are wonderful! Very tasty,and a perfect addition to my afternoon blueberry tea. Dec 27, 2015 | By Martha C.
This is the perfect addition to my cup of coffee! Texture,taste..it has it all. I have only eaten one so far of the Blueberry Lemon Biscotti but I really did enjoy it. 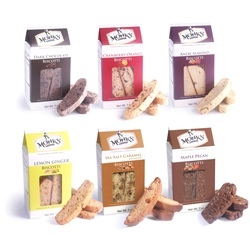 Oct 16, 2015 | By Laurie S.
My husband is Italian and he loves good Biscotti! Let's just say I never got any to taste on our last order-someone got to it first! i only heard how good it tasted- ordered one with Almonds.